Where can I buy adult coloring books? Home » Where can I buy adult coloring books? You hear about all your friends getting into adult coloring, so where exactly can you buy adult coloring books from? There are several places, both locally and online that you can purchase these trendy coloring books made for adults. In this article, I will go over the most common places you might find coloring books for purchase. Coloring has become a major trend in popular culture. Everywhere you look online, there are references to how great coloring is, and people offering free coloring pages that you can print out on your computer. If you are looking for the excellent quality you can get in a professional book, though, you may be finding it a little bit harder to get the coloring books you need. So where can you buy adult coloring books? They are not exactly at every gas station yet, but if you know where to look you will be able to find a great selection at any time. Michaels is an arts and crafts supply store that offer everything from yarn to canvases to beading supplies to, yes, adult coloring books. Hobby Lobby is its main competitor, with selections that also include home décor and many other fun activities for you to enjoy. Both of these stores supply adult coloring books, along with high-quality markers, colored pencils, pens, and even crayons and paints for your coloring enjoyment. The biggest brick-and-mortar bookstore chain in the country, Barnes and Noble has a large selection of adult coloring books for you to enjoy. Since they are not an arts and crafts store, the selection of coloring utensils they offer is naturally going to be smaller, but you can count on them having good quality choices that will give you a good coloring experience. The drawback to buying your books and colored pencils at Barnes and Noble is that you are likely to pay more than if you price-compared them online since the store is geared more toward higher quality offerings than low prices. If you are looking for low prices, you will want to go to Walmart. This is where you will get the bottom-line, most affordable adult coloring books, along with the bottom-line, most affordable colored pencils or markers to color them with. If you are on a budget, this is a good way to get your coloring fix in. However, keep in mind that the coloring books and (especially) the coloring supplies you find at Walmart are not going to be very high quality. You might find yourself disappointed in the vibrancy of the Crayola colored pencils, for example. You do get what you pay for, but if you are willing to put up with a few annoyances for some savings, you can get good deals on coloring books at Walmart. Amazon is a great place to get adult coloring books. There is a massive selection at many different price points. You can search for hours and still not come to the end of the coloring books on Amazon. It can be overwhelming with so many choices to pick from, but you can be reasonably confident about getting a coloring book you will enjoy coloring in. One of the benefits of buying on Amazon is that you can get everything you need for your coloring venture – books, markers, colored pencils, crayons, and pens – in one place, with no restrictions on what is available. On the other hand, one of the drawbacks of buying on Amazon is that it can be difficult even to figure out what you want to buy since there are so many products available. Gift shops are a great place to get specialty coloring books. Since coloring books are a great present for anyone in your life, you can pretty much count on finding them in any local shop that specializes in gifts. Here at Art Therapy Coloring, we actually offer wholesale coloring books to gift shop owners, bookstore owners, etc. Never underestimate the power of your small local bookstore to have the coloring books you need. Your local bookstore owner probably is very careful to get unique and exciting titles in that will appeal to the customers in your area, especially if the physical space in the store is limited. And if you don’t see the coloring book you are looking for in your local independent bookstore, ask the owner to order some. They will appreciate the feedback about what their customer base wants to buy, and you will be doing them a favor. 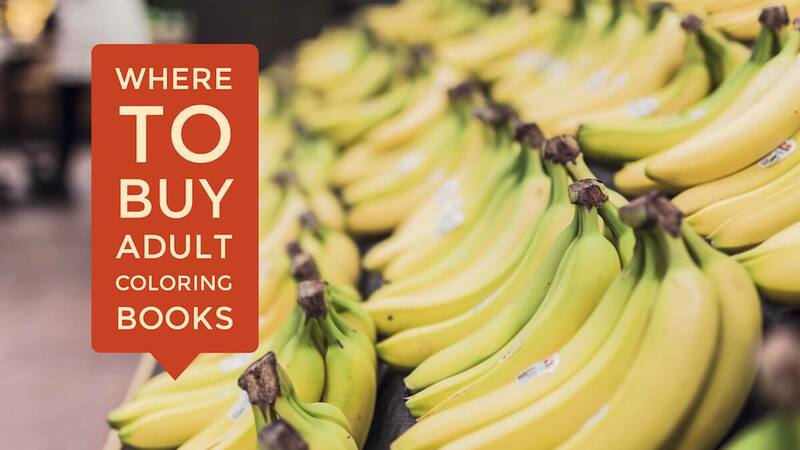 You might not think of grocery stores as places that sell books, but most have at least one aisle dedicated to the most popular titles of the day, and coloring books fall into that category. And you don’t have to have a mall with a bespoke bookstore in it to be able to find coloring books – gift stores and novelty stores are also likely to offer something for your coloring needs. Shamful plug 🙂 – Here at Art Therapy Coloring, we offer a wide range of coloring books created by our talented designers to appeal to all sorts of colorists. No matter what age you are, no matter if you are a man or a woman, no matter what kinds of things you are interested in or what style of art you like, we have coloring books for you! Let us show you the Art Therapy Coloring difference. Order today and start your coloring journey right now!